THOROLD, ONT – Matt Tanner needed nearly every lap in Saturday night’s Lucas Oil Super Sprint/Mach 1 Chassis A-Main at the Merrittville Speedway to put himself out in front of the field. The Stephentown, N.Y., driver worked and worked to get to the front and finally secured the top spot in the Gary Cunningham Memorial with just two of laps to go. That wasn’t the end of the fight for Tanner as he had to navigate traffic while not surrendering the lead back to upstart Ryan Turner. 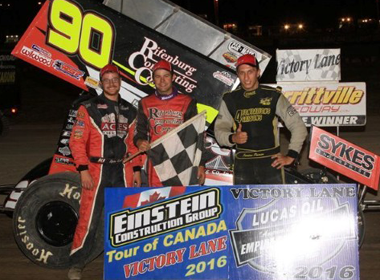 At the end it was Tanner picking up the $2,350 winner’s share in the Einstein Construction Group Canadian Series event over Turner for his first win since August of last season at the I-88 Speedway. Steve Poirier started on the pole with Parker Evans alongside. Evans gained the advantage on the top of turns one and two but that was the end of their battle as before a lap was concluded contact between them sent Evans tumbling in turn four. Evans night was over and Poirier was relegated to the rear. This now put Jordan Poirier on the point with Stan Zanchin flanking him to the outside. Jordan gained the lead on lap one before Turner got a run on the inside to take the position on lap two. Jordan then shot back around Turner to lead lap three. Turner remained patient while parking his No. 91 on the inner part of the surface. Jordan continued to work the cushion. Turner’s lane proved to be faster allowing him to retake the top spot on lap nine. Turner opened up a slight lead on Jordan before caution slowed the pace of the action on lap 12 as Zanchin spun in turn four. This set up a double-file restart. Racing went back to green with Turner holding off the challenges of Jordan with Tanner joining the fray from his 12thplace starting spot. As the laps clicked off on the three-eighths mile oval, Tanner ran the middle lane with Turner low and Jordan on the cushion. The three drivers never deviated from there line. That was until the race reached the final few laps. At that point Tanner decided it was time to make a move. Twenty-two laps were complete when Tanner was finally able to use slide job in turns one and two to get by Jordan for the runner-up position. This put him back on the cushion, the line that he had used to work his way into the top three. From here he tracked down Turner. Tanner made the pass for the lead as the pair exited the fourth turn with only two revolutions of the track remaining. He barely beat Turner to the line. That wasn’t the end as they now had to fend off each other while working through cars at the back end of the field. The while flag came with Tanner working the high line and Turner down low. They both cleared the slower cars as they exited the second corner. Tanner remained on the cushion as Turner dove as low as he could to find moisture to propel him back to the lead. At the line it was Tanner by .473 over Turner for the win. Port Colborne, Ont., driver, Dave Dykstra finished fourth in the order while Steve rebounded from the lap one incident to secure the final spot in the top five. ESS/Merrittville Notes – A total of 30 cars filled the pits in front or a huge crowd at the D-Shaped oval…15 locals drivers joined the Lucas Oil ESS faithful with Jake Brown making his first ever ESS start…The 7-12 Challenge has now been claimed 4 times with Tanner taking the biggest slice of the pie to date at $300…Next up is the Donath Motorworx CNY Speedweek, June 29-July3. Did Not Qualify - Mike Stelter, Lee Winger, Shawn Donath, Havard Daniels, Scott Sherk, Jim Porter. Lap Leaders - J. Poirier 1, R. Turner 2, J. Poirier 3-8, R. Turner 9-22, Tanner 23-25. Car Mate Trailers Heat 1 - Huppunen, S. Poirier, D. Axton, Dykstra, Westbrook, Barney. Doc Magilligan's/Cobra Coaches Dash - Kinney, Westbrook, J. Brown, Barney, R. Turner, J. Turner. Lacaillade Masonry B-Main - Susice, Kidd, Kruchka, Jones. Provisonal Starters - Preston, T. Axton.